I was in the shower when I spotted it, which means it must have been fairly big since I was wearing neither my glasses nor my contacts. 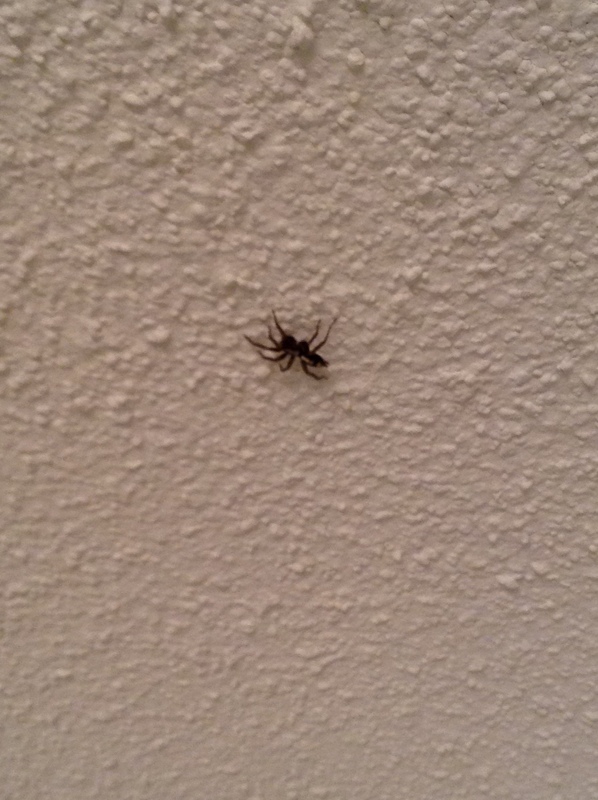 As it moved across the ceiling at a brisk spider pace, an idea blossomed in my mind. I finished my shower, shut off the water, and wrapped up in a towel. I grabbed my tablet and snapped a quick close-up picture of the spider. I sent the image to C, who was sitting innocently on the couch, one floor below me. “Can you come kill this for me?” I messaged, knowing the obvious answer. “No. That’s scary,” he messaged back. Now, don’t get me wrong. I am more than capable of taking care of the spider myself. I have dealt with every spider in this house since we moved in over twelve years ago. But seeing as C is now an adult, I want to see how he will handle this. And it’s actually quite funny. “Why aren’t you up here killing my spider?” I ask him. Since historically, it has been him asking me to kill the spiders, I am expecting him to jump at the chance to repay the favor. Not. “I tried to send W, but he refused,” he admitted. And there it is, friends. Passing the buck to see if someone, anyone, might take care of the spider for him. In the end, I trapped the spider and carried it outside where it will live a much happier life than it would in my bathroom. However, I am not sure what C is going to do when he is on his own. I just hope he knows how many babies one spider can produce. To kill the spider or not to kill the spider? Adulting can be complicated. Yesterday, I learned something because, as we all know, “You learn something new every day.” But what I learned yesterday is disturbing, at best, and indicates a new level of waste and laziness. My kitchen light is on the blink—quite literally—since last week. I was sitting at the table working when it blinked off. But only halfway. Now, it has that annoying fluorescent strobe effect going. Or it would if I left the bulbs in it. I purchased new ones and then returned them when we deemed the problem to be the fixture. My 14 year old examined the light and determined it needed a new ballast. He went online to find out where we could get one, and how much it would be. I still have to look in the local big box stores, but the proper part was located on Amazon for $40, which seems a bit steep to invest in an old, ugly light. Then again, I don’t have to invest in an electrician because I have a 14 year-old, but I digress. When we went to the local home center to look at lumber (don’t ask), we stopped in the lighting department. I figure if I can get a fixture for not much more than a ballast, it might be a better option. I turned and looked at the box. “Wait. So those are disposable fixtures?” I asked to no one in particular. “That can’t be right.” And yet, the majority of fixtures on the shelf were in similar boxes, all of which touted, “No bulbs to replace.” As if that is somehow a good thing. I couldn’t believe what I was reading, so I opened one of the boxes and pulled out the light. In fact, there were no bulbs, and inside the light was a circuit board with several small square non-replaceable LED lights on it. “Not only are there ‘no bulbs to replace,’” my son said, pointing to the LEDs. “Those are all going to go out at different times.” He smirked. “Well that would stink,” I remarked, thinking of my own half illuminated kitchen light. But really, I am still in disbelief. A “fixture” is supposed to be fixed, and yet, the fixtures we saw yesterday are disposable. 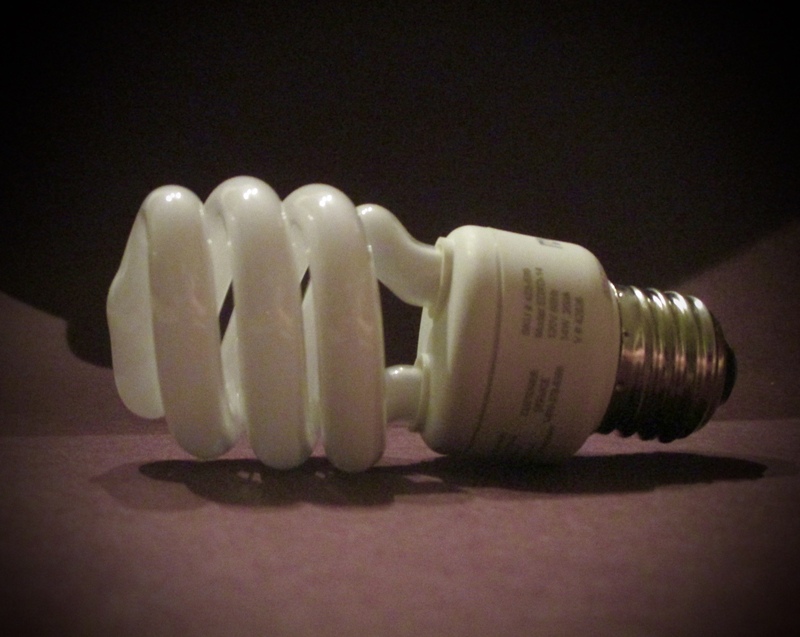 When did it become so difficult to change a light bulb that it’s easier to remove the entire light and throw it away? And just how is that easier? Either I’m on a steep learning curve, or I’m missing the purported benefits of no light bulbs. So maybe I went a little overboard on the medical supplies. Then again, maybe not. My children were away for ten days with their father. While they were gone, I had a bit of time to gather some of the items my son still needed for college. 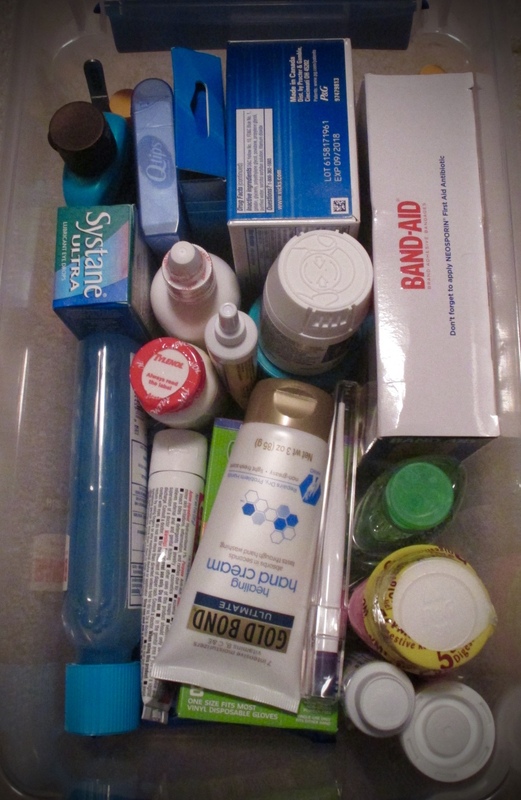 It was during this 10-day span that I created the box of medical supplies. 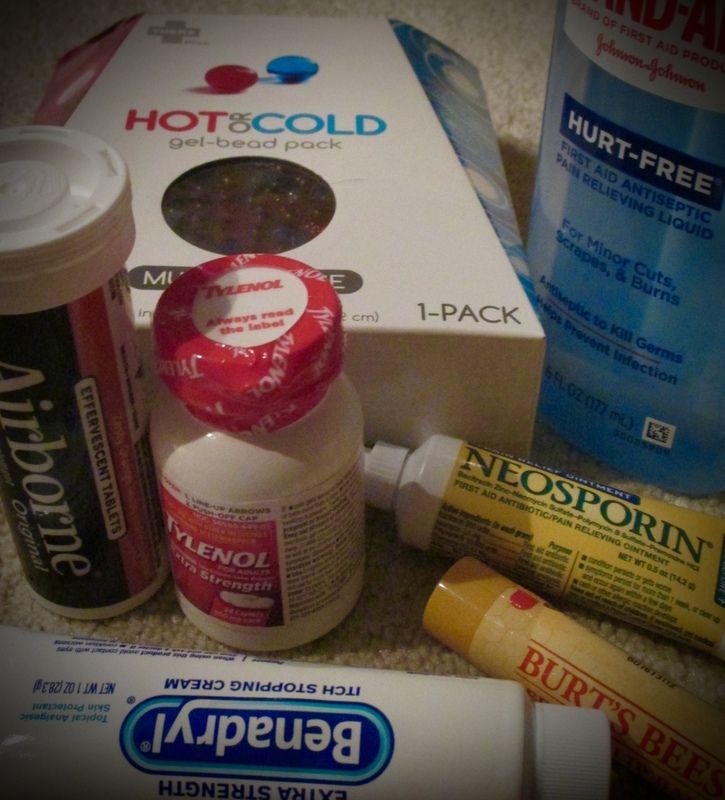 He asked for a “First Aid kit”—bandaids, Neosporin, pain reliever, cold medicine… the basic stuff. But I knew he’d need more than that. During this time, I also happened upon a post on a social media site with a do-it-yourself medical kit for the college bound student, complete with supplies list. Booyah! So while he asked for a first aid kit, what he got, well…. “Whoa! It’s like I have a scary, overprotective mom!” I heard him exclaim from his room when he first discovered the box. Images of Mrs. Benson from the once-popular television show, iCarly, flooded my mind. I went to his room to explain. “You know,” I started, in my own defense. “This is all stuff you might need, and other people in your dorm probably won’t have this stuff, so they’ll come to you. Who knows?” I smiled my most innocent, non-crazy smile. He pulled out the bottle of ibuprofen, much smaller than the one we keep in our medicine cabinet. “I might need more than this,” he told me. “That’s fine for now,” I responded. “There are fifty in there.” He continued to poke through the contents. “I put your chapstick in there, too,” I told him. “Oh, and I got you some gloves.” I pointed to the small box of eight medical gloves. He looked up from the box, his mouth hanging open. “Really?” he finally managed. Now, let me explain. I have lived in dorms for more years than most people I know, and I’ve been cleaning up biohazard since before it had that name. First of all, as a freshman in college, I very distinctly remember one night when I cleaned up after my roommate. I’m sure she could have done it once she sobered up, but in the meantime, it was my room, too. After college, I worked as a dorm parent in boarding schools for many years. I cleaned up my share of biohazard, but the most memorable involved a fist and a window. Enough said. I certainly hope my son is lucky enough to never need the gloves. But chances are, he might, so it’s best to err on the safe side. And if he becomes an RA in the future, I will definitely spring for a bigger box! My Facebook feed is filled with statuses of young people who are going off to college. Parents have posted pictures of various aspects of the approaching college experience: the “stuff” that has been accumulated to outfit a dorm room; dorm rooms after set up; student send-offs and final hugs; and these same young people posing on beautiful campuses, just before the parents get in the car for the drive home. My son will leave for college in a few short days. We have a pile of “stuff” in our house that we are trying to pack into as few containers as possible. I am washing towels and bedding and clothes. I have collected paper goods and toiletries and school supplies. He tells me his pants are too short, and he definitely needs new sneakers. Luckily, he can wear shorts until he comes home to visit in October. After all, it won’t be that cold on campus until then…. It is an exciting time for these college freshmen. They are going off on a great adventure, and they are, quite rightfully, excited. And I am excited for my son. But I have other feelings, as well. Even though this is a great step in his life, I know that there will be times when he feels like he is in the wrong place. When he thinks he has made the worst decision of his life. When he is deeply lonely. And I recognize that these are all necessary feelings and experiences as he navigates the waters of life and of grows into adulthood. But I am his mother. So, there are some things I wish he didn’t have to go through. I wish he didn’t have to question his decisions, experience loneliness and homesickness, navigate the challenges of being away from home, and wonder if he would be better off somewhere else, but not really know where. If I could, I would guarantee him a life of smooth sailing and unbridled excellence. But what kind of life would that be? Certainly not one of growth and ever expanding maturity. So I will send him off as prepared as possible to tackle the things life throws at him. Today, I am packing up a box of medical supplies, simple things like bandaids, cough drops, pain relievers, and a thermometer to get him through the bumps and bruises of the next four years. These things are minor, but they are things he would have readily available here at home. Hopefully, when he is feeling down and not his best, he will open the box and realize that even though I am several towns away, I am still caring for him, supporting him, and loving him. And hopefully, he will remember that I am only a phone call (text, email, whatever) away. If he needs me, I will always be here. I once read the book The Boy on the Bus by Deborah Schupack. I believe this book was born out of the very familiar and somewhat unsettling concept that children tend to change just a little bit each day, until one day you look at your kid and you think, There is something vaguely unfamiliar about this child. Is this really my child? The book itself was unsatisfying in its lack of resolution, but the premise of the book is that the boy who gets off the school bus one afternoon is not the same boy who got on the bus that morning. He looks almost like the same boy, but there are things that are just a bit off about the child. I would like to admit this is a fairly universal experience for parents. Well, it is for me, at any rate. 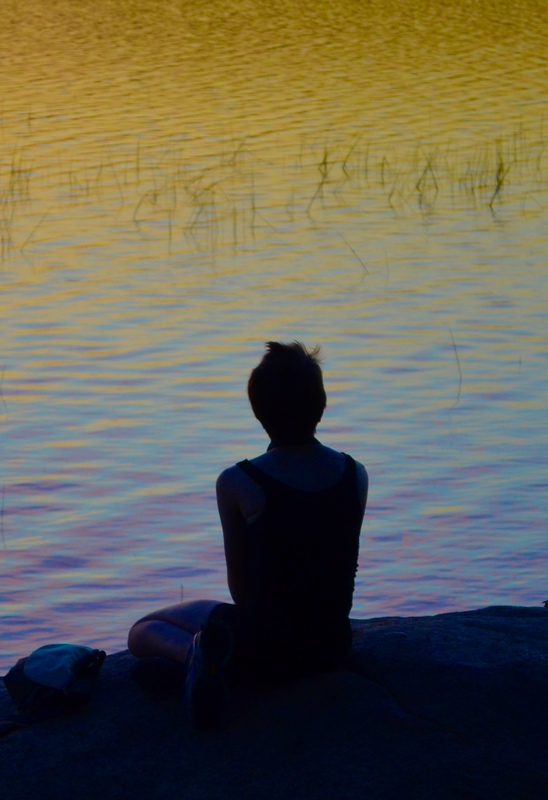 The child who leaves my house in the morning is sometimes very different from the child who comes home that afternoon—whether in mood or demeanor. And every now and then, the child even looks just different enough that I question myself. Is this really my child? Maybe not. Earlier this summer, when I retrieved a child (my child) from a week at camp, I hesitate to admit that I almost didn’t recognize him. It had only been a week, after all. What kind of mother doesn’t recognize her own son after only a week?? Well, first off, he was wearing a baseball cap. The same red baseball cap that adorned the heads of all of the campers on that day. And my kid doesn’t wear a baseball cap. He hasn’t since he was about six or so. Second, all of the campers were dressed alike. And third, he had gotten a haircut right before he left. His hair was a bit shorter than usual, making him look older than I was used to. Therefore, I would attribute my brief lapse in recognition to the combination of those obscuring traits. It took me an extra minute or two to find my child that day. But even on a regular day, I can look at one of my children, recognize something unfamiliar, and have the unsettling thought, Maybe this is not the same child…. I sit in my car listening to NPR, staring out across the lake. A group of water-fowl float in a line in the middle of the lake, lazily drifting across the surface. The story on the news is focused on discussion of the opening ceremonies of the Olympics, the troubles in Rio, and the profound separation of the haves and the have-nots in that city. It is peaceful and quiet at the camp. The campers left for home earlier in the day, and only the staff remains, finishing up their Friday staff meeting. Every now and then, a burst of deep male crowd voice breaks the silence. First, a cheer—a group of young men voicing the same words loudly and in unison—bursts from the meeting hall up the hill. A little while later, laughter. And still later, applause. The voices are deep and grown up, and can’t possibly include my youngest child. But then again, they can. He has grown and changed—and continues to do so—on a nearly daily basis over the last year or so. The image that I have of him in my head doesn’t match the reality of who he is and who he is becoming. He is part of this group. He fits in. Somehow, my mother-image of my children is not keeping up with their growth and their approaching adulthood. My image is mired in memories and the experiences of raising them from their earliest days through the years up to the present. Every moment blends together to create the image that I hold of them—always younger than they truly are unless they are standing right in front of me. Some people might say my mother-image needs adjusting, but I think it is fine just the way it is. At least for now.